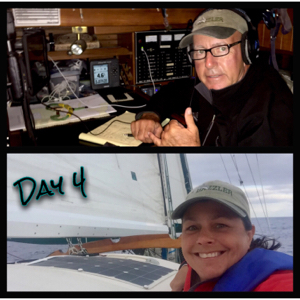 3.28.18 @ 1000 Local, 1700 Zulú Day #4 Latitude: 17°59 N Longitude: 112°08 W Covered Distance Last 24 Hours: 120 NM Distance to the Marquesas: 2290 NM Distance from Punta de Mita, Mexico: 465 NM Weather: 40% Scattered Clouds Winds: NNE 8 knots Sea State: 2’ – 3’ swells out of the NW Barometer: 1016 Crew’s Mood: Fine & Dandy but we’d like some wind please! Well, it was a great day for sailing. Dan woke me up shortly before dawn and we were cruising along at about 6 knots. He went down for some rest and there were a few times we hit a little over 7! Yes, Dazzler is in the groove and loving these 11-15 knot winds. We really made some nice time this morning. It was awesome! Once Dan awoke I headed below to do my morning chores… check the veggies, make ice, turn eggs, those kinds of things. Tonight we are having creamed chicken so I needed to make Garlic Cheese biscuits. You’ve never really cooked until you’ve done it on a rocking boat that is healed over 30° while your ingredients are jumping about the galley like Mexican jumping beans. “Get over here you lil sucker!” Add to this the fact that your oven swings, doesn’t cook evenly and won’t get above 400°. Yes, anyone can cook on land. It takes real skill to cook on a moving boat baby! Yep, it took a while but I got them done and they were pretty doggone tasty. After all that it is time for a nap! I’m exhausted! Dan kept Dazzler moving along until the winds just crapped out on us. We tried putting the pole out on the Jib and pulling the main to the opposite side for a wing on wing effect but that was a bust. We just bounced all over the place. So, we went back to our normal configuration and kept trying to plug along. Not long after dark the winds picked back up and we got to 5 knots again. At least until about 12:30 a.m. Dan came back on watch then and decided we had to fire up the iron Genny for a bit. I went down to sleep. One side note to the day… We received a communication from SV Patience letting us know SV Aftermath had lost steering the night before. Those two boats are close together so Patience is in visual contact as well. We were about to change course to head that direction when we got a follow up communication that all is repaired and they are back underway. That’s one nice thing about being out here with all the other jumpers… you know everyone is looking out for each other. Next post: [Dazzler’s Watch] Comment: Who’s yo daddy?